Digger EA is based on the price capability to move in a particular direction during day and highly volatile periods. The backtest has been conducted from 2009. 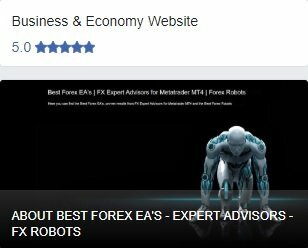 The Forex Expert Advisor calculates position volume based on the market situation. 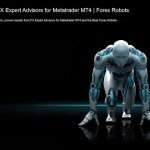 The trading robot can use up to 4 averaging. The EA does not use StopLoss. Conservative mode (ConservativeMode=true). In this mode, the DiggerEA does not use averaging\grid\martingale MM. 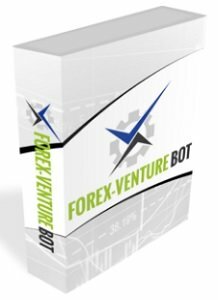 The trading robot uses stop loss and time stop to control the risk. Aggressive mode (ConservativeMode=false). 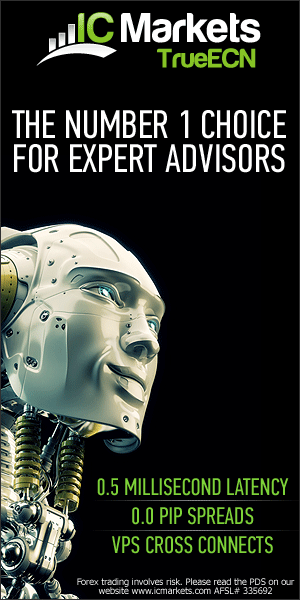 In this mode, the trading robot can use up to 4 averaging. The EA does not use stop loss. Timeframe – M15. 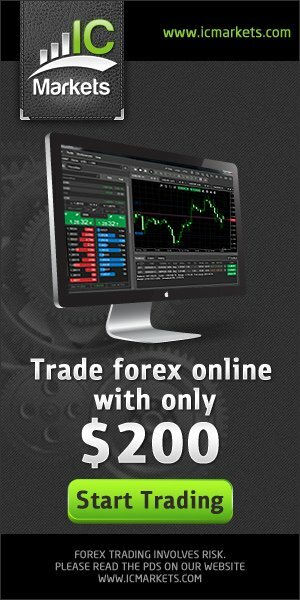 Currency pairs: EURUSD, GBPUSD, USDCAD, NZDUSD. The EA can be backtested by bars or every tick. 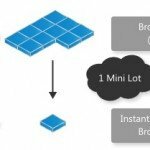 StartLots – starting lot size. This is an initial base lot to open a trade. 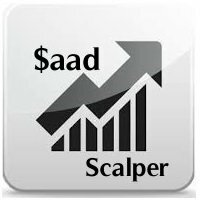 It can be modified by EA based on a market situation, but no more than twice. 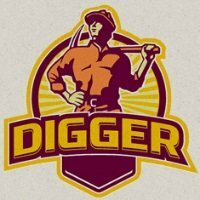 UseMM_Balance – value in deposit currency. If this option is set (i.e. different from 0), then the starting lot is calculated per each part of UseMM_Balance of deposit. If set to 0, then the starting lot is fixed and equals StartLots. For example, if StartLots=0.1 and UseMM_Balance=300, when the deposit is 300, the EA will open an order of 0.1 lot, when the deposit is 600 – 0.2 lot, when the deposit is 900 – 0.3 lot, etc. This parameter is needed for reinvestment. StartLots%Depo – initial lot value in %. When not zero, the initial lot is calculated as % of the deposit, StartLots and UseMM_Balance parameters are ignored. If zero, then EA will work with StartLots and UseMM_Balance. 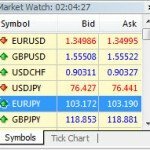 TakeProfitPip – profit target in pips (4-digit quotes) as of the trade open price. TrailingStopPip – trailing stop in pips. 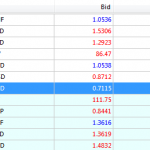 SpreadFilterPip – spread filter in pips. If spread is more than this value, then signal will be ignored. 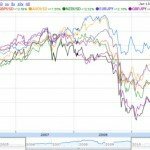 ConservativeMode – if true, the EA will not use averaging and martingale\grid elements. 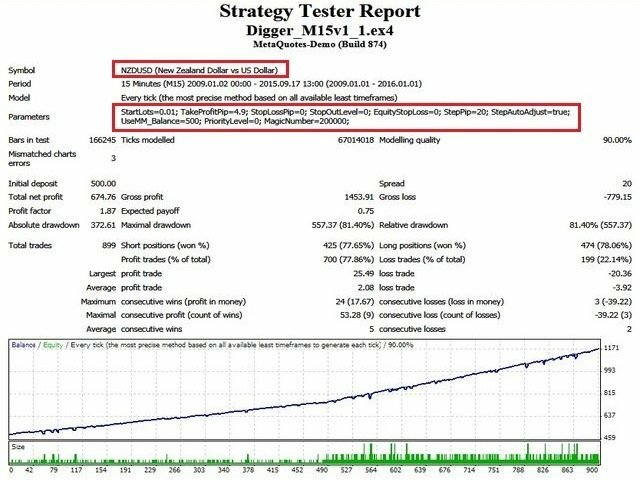 The DiggerEA will trade only favorable situations and will control risk by using stop loss (StopLossPip) and time stop (TimeStop). 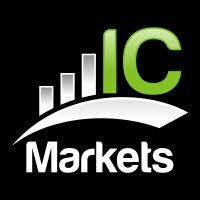 PchFilter – if true, the DiggerEA will use a filter based on location of prices in the intraday trading range. For ConservativeMode=true only. SignalBarSize%ATR – the body size of the signal bar. For ConservativeMode=true only. WickSize% – the shadow size (upper\lower for buy\sell) of the signal bar. For ConservativeMode=true only. TimeStop – certain numbers of bars after which the position will be closed if trade does not reach take profit or stop loss. Technical stop losses. When stop loss is triggered, all orders will be closed by the EA. If set to 0, the stop loss is disabled. 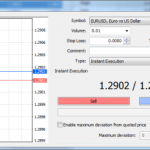 StopLossPip – stop loss in pips from the entry price. The StopLossPip is must have for ConservativeMode=true. StopOutLevel% – account margin level in %, at which the EA will close all trading positions. EquityStopLoss% – percentage from the initial equity. If the current equity drops below EquityStopLoss%, the EA will close all trades. PriorityLevel=0…10. If multiple advisors got the signals to open a new position simultaneously, the position will be opened by the EA with a higher PriorityLevel (0 – the highest priority). MagicNumber – unique number of the EA’s orders. To trade multiple instruments, you must open separate charts for required currency pairs and attach the EA on each of them. In this case, the MagicNumbers of all DiggerEA must be same. To reduce the risk, only one EA can open trade at a time. For example, if one DiggerEA gets the opening signal while the other DiggerEA has already opened position, the signal will be ignored and the new position will not be opened. ID – unique identifier for the EA. Used for the better control of orders when running several of my EAs (such as Digger, Miracle) with same MagicNumber. Minimum leverage – 1:100, higher value is recommended.